Guest Blog: Claiming Rule Teams, a success? media for not being competitive enough. towards the bottom of the timing sheets. respects he is not as far off the mark as you may initially think. who run Karel Abraham. Team owner and Karel’s father, Mr Abraham Sr. describes the move positively: “The transition from prototype is not a step backwards but rather a side-step”. The bikes increased too – 21 contested the 2012 championship. 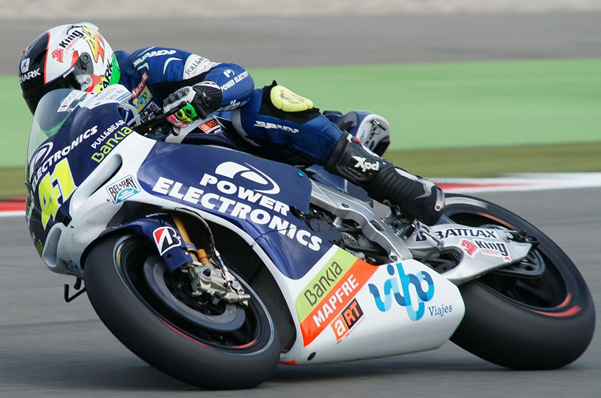 As well as retaining Aspar the new rules allowed Gresini to be able to field a two man squad. Suzuki parted company with MotoGP citing the recession as the major factor in their decision. finish for a CRT all season with a fifth place for Gresini. MotoGP website: “I know(it was) in wet conditions…but in any case a CRT was leading the Valencia Grand Prix”. Austrian team Schwarz and Bronnen have been entered for Brno. potential of the class: “Theoretically the riders that are using CRT are not the top riders and I want to see … though thisis impossible… if any of the top riders would use a CRT, I don’t know how big the difference would be”. riders may have left the paddock if they had not found a development role in a claiming rules team. to be compulsory from 2014.
learning curve are certainly positives to start the new season on.